Install Blender Download latest Blender m2i Scripts and install them into blender Use M2Mod to produce m2i file and import it into Blender Edit your model Export your model to m2i file Use M2Mod to create new m2 file based on exported m2i and base m2. Here is my multi converter, it can convert m2, wmo, adt, wdt and anim (7.3.5) from Legion to be used on wotlk (map can be visited with the client or edited with noggit). M2 using .skel are not supported. To use it just open it then drag and drop the files you want to convert (or a folder containing some, subfolder included) and click on "Fix", the files will be overwritten and it will delete the files that are unused on wotlk. If the .skin files are in the same folder they will be converted too. M2 already converted to LK format won't be converted again. As for WMO converting them multiple time won't affect them. ADT need their _tex0 and _obj0 counterpart to be converted. Warning: don't take the WDL files from blizzard, they have changed and causes wow error. Warning 2: the next releases of Noggit will require you to use the version 3.3 or newer, the m2 converted with the old versions were missing some data that Noggit now need, without it'll crash. Tell me on which model(s) you've seen the problem and add screen(s), it help me fixing the problem faster. And send me your error.log where there are errors during the conversion !! All those who contributed / are contributing to the wiki, I couldn't have done it without this precious source of informations! Mjollna for her m2 converter and awesome ADT diagram! PhillipTNG for his m2 conversion script which helped me write mine in the beginning. Sources are now available, see last release. I uploaded these because I couldn't find them anywhere. But instead the Easy BLPConverter call directly the BLPConverter.exe program with argument which is faster. argument are parsed from given directory and sub-directory (it exclude cape because they appear green if you convert them. *optional). Will print a suitable (casc) Listfile of given directory. Press Convert Blp's Button wait to finish, then Run Rename BLP and you're done. hopefully this will save you some extra time enjoy. An old WoW Alpha MDX Converter/Viewer to OBJ Converter. It converts all WoW Alpha mdx files into OBJ files with mesh and uvmaps preserved. No weights, animations or particles!!! The UV-Map need to be mirrored at Y-axis to be correct. Made by DaishiOfDeath, i'm just reuploading it here since the converter has nearly disappeared from the internet. This tool allows to find the FileDataID according to the path of the model. It is still unstable but works. I foresee in the future a filter system by format. This script changes the texture type of a belt buckle m2 to "hardcoded", so you can attach it as a spell in WotLK. 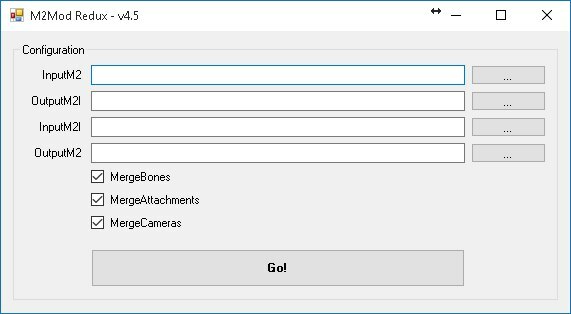 -Put the models you want to modify inside the folder called "Models". It copies the name of your current model and creates a texture path with the same name. If your model is called "Buckle_pinkunicorn" it will create a path called "Item\ObjectComponents\Waist\buckle_pinkunicorn.blp". This script only works if your model has "BUCKLE_" at the start of its name. If you wish to have all 3 variations, copy the model and change the name of its copies to "Buckle_Leather_RaidMonk_N_01Blue.m2" and "Buckle_Leather_RaidMonk_N_01Red.m2" so the path matches. I made this script to convert multiple models from Legion to Wrath of the Lich King or Warlords of Draenor. Requires 010 editor. The first script removes the unnecessary information before the M2 header and changes its version from 274 to 272 to make it work in WoD. The second one does the same but also runs Philip's converter on the M2 files to make them work in Wotlk. -Put the models you want to covert inside the folder called "Models". This script can also read all the subfolders inside "models" and convert every M2 inside of them. I needed M2mod Redux version 4.5 for the modeling tutorial, but it couldn't be found anywhere in the internet. Thankfully, I found the archive on my computer (since I never clean my downloads folder and it's like 65 GB now) and decided to upload for anyone who might need it. When converting things such as Items from WOD to WOTLK, you will need to convert the BLP Files (textures) to the correct format so that the game reads it correctly. This is a simple batch file script that will help convert all the BLPs in one quick sweep, its not perfect but its better than doing it all manually. 4.Do a search in the ProjectFiles folder for ".blp"
7.Go onto the "Actions" menu, and then click on "String Replacement"
I thought I would share this tool as it made it way easier to convert BLPs in bulk, i know that the rename method could be made in the bat file itself, but i do not have the time to work that out at the moment.